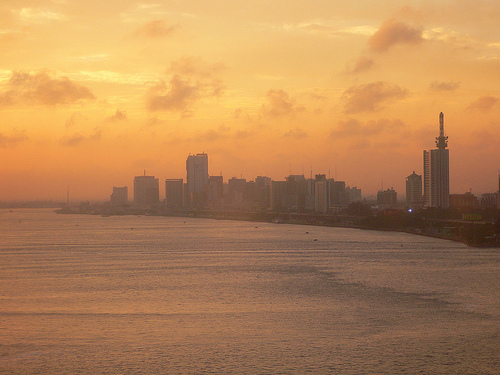 The skyline of Lagos, Nigeria's largest city, at sunrise. We continue our journey to different parts of the world with a trip to Nigeria. The country is located in the Western part of Africa, with land along the Atlantic Ocean. Since gaining its independence from the UK in 1960, Nigeria has lived through military rule and civilian rule, but its democratically elected government must now deal with increasing ethnic/religious strife. As the most populous country in Africa, the way it deals with these issues may have a profound impact on its neighbors. Oil is the largest industry, and Nigeria is currently ranked 7th in international oil exports. The current president is named Goodluck Jonathan. He has served since the previous president died in May 2010. New elections will take place in 2011. Nigeria encapsulates tropical rainforests, coastal plains, highlands, savannah, and the semi-arid region of Sahel (in which the Sahara is beginning to encroach). A recreation of the epic 1960 World Series finale respectively profiles the Pirates and Yankees teams; cites the contributions of such figures as Mickey Mantle, Yogi Berra, and Whitey Ford; and recounts the dramatic walk-off home run that decided the outcome of Game Seven. The Soviets’ new ballistic-missile submarine is attempting to defect to the United States, but the Soviet Atlantic fleet has been ordered to find and destroy her at all costs. Can Red October reach the U.S. safely?. Describes the events that occured on a Soviet warship in 1975, where the crew mutinied against the captain to protest against corruption in the Soviet government. A study of a seminal season in the history of American baseball offers a close-up look at the 1964 clash between the Yankees, representing the status quo, and the St. Louis Cardinals, a tough, young team on the rise. The “Undiscovered Country” of the author’s imagination is revealed in a collection of stories that chronicles an underground city where drowned lovers are reunited, a carnival where a miniature man has his dreams fulfilled every night, and a glass jar that hold memories and nightmares. Tormented over choosing between his faith and his family, Johnny Pera is determined to unravel the truth behind the failed plot to kill Cuban dictator Fidel Castro, and he is haunted by the chance that his own father might have been involved. Horror and Halloween themed fiction and non-fiction written by such authors as Dean Koontz, Christopher Golden, Ray Bradbury, Poppy Z. Brite, and Ed Gorman. The former Soviet naval analyst revisits the tense, terrifying thirteen days that constituted the Cuban Missle Crisis to recreate the near apocalyptic confrontation between nuclear superpowers. A novel of the final days of the Roman Republic explores the love affair between Julius Caesar and Cleopatra, the assassination of Caesar, and the struggle for power that leads to the rise of the Roman Empire. Living in her older brother’s Vermont farmhouse, penniless widow Sally Abbot finds their clashing values escalating to the point that her brother banishes her to her room with a mainstream novel she has been reading, a book that becomes reflective of their turbulent family history. The author traces the boyhood enthusiasm for rockets that eventually led to a career at NASA, describing how he built model rockets in the family garage in West Virginia, inspired by the launch of the Soviet satellite “Sputnik”. As Katie and Daniel adjust to marriage, Katie reaches out to her family for acceptance, Rachel’s husband Philip tries to fit in with his new Amish peers, and Levi continues his courtship of Lydia. In 1959, Sally Maulden, 13, goes to live with her grandparents in Coldwater, Arkansas, while her parents are considering a divorce, and she discovers an eccentric group with their own agendas. Stunned when his wife of eighteen years leaves him with no explanation, an art historian struggles to make sense of his life and marriage and begins to realize that two people can live together for years without ever really knowing each other. The Montgomery County police chief at the head of the manhunt for the serial snipers who shot random victims during a three-week period in Maryland and Virginia recounts the investigation that ultimately lead to the suspects’ capture. Since September came and went without a visit to a new country, we’ll visit two in October. The first is Turkey – a country that straddles two continents. The Bosphorus Bridge links the Asian and European parts of Istanbul. The city of Byzantium, became New Rome, then Constantinople, then Istanbul. (And is the inspiration of the goofy song “Istanbul” – my favorite version is by They Might Be Giants). Although the country’s religious make-up is almost 99% Islam, the country does not have an official state-recognized religion. Turkey is one of the founding member of the United Nations and is a close ally to the U.S.
Or, check out a work of fiction by the noted Turkish author (and winner of the 2006 Nobel Prize for Literature), Orhan Pamuk.